In recognition of the Inherent and Treaty rights to education for First Nations, and founded on the Philosophy and Practice of our First Nations Schools, the Prince Albert Grand Council promotes the following Vision and Mission for Education, specifically Language and Culture. Learning is a Life-Long Process. Our First Nations people are unique and worthy of the best possible quality education we can provide. We shall promote a comprehensive bilingual and bicultural education for our people with respect to their diverse languages and cultures. We shall recognize and promote the pride in cultures, languages, and values among our First Nation people. The PAGC language and culture programs (New Paths) have been busy with language initiatives based on community request and needs. 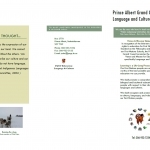 In preparation for curriculum and app development, we worked with the following communities: PAGC Education Language and Culture ‘Branch’ is in the final stages of creating a Plains Cree app for James Smith First Nation (JSFN) and Sturgeon Lake First Nation (SLFN) and they collected 1029 words and phrases. The Swampy Cree app for Cumberland House Cree Nation (CHCN) collected 2092 words and phrases, and the Woodlands Cree app for Montreal Lake Cree Nation (MLCN) collected 948 words and phrases. The Athabasca communities of Black Lake First Nation (BLFN) and Hatchet Lake First Nation (HLDN) collected approximately 2550 words and phrases. 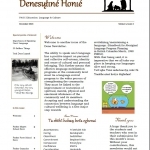 In the fall we begin working with the Fond du Lac (FDLDN) scope and sequence, they speak the ‘K’ dialect. When the scope and sequence process is completed, the work of editing begins then the audio recordings commence. Both processes of scope and sequence and app development is a tedious process and time consuming. In preparation for the app, photos are collected and correlated (keeping in mind copyright issues). We appreciate the work of elders and editors who are involved in this process; this is valuable language work for our communities. Upon completion of the app recordings, the content will be uploaded on the PAGC website and ready for distribution to the schools. Because we collect language data, the main goal is to develop grade appropriate curriculum. This is the third phase of the language and culture curriculum project. Once the curriculum is completed, we begin methodological and pedagogical training for teachers – how to teach language and culture programming and promising practices to deliver programming. We know there are curriculum available; however, we want to develop programs from the voices of the PAGC communities. Based on Truth and Reconciliation recommendations and call for action and the Indigenization movement of ‘reclaiming’ our identity, it is incumbent upon us to collect language and culture data to revitalize, maintain or strengthen our language that elder’s value. The Residential Schools, Sixties (60s) scoop and the colonial policy to disseminate our languages has ‘interrupted’ our cognitive intelligence. Our language and culture is alive and thriving by how we speak, and actions of cultural practises we do daily. We seek measures to improve our language work and we hold two workshops for language teachers yearly. This coming school year we are working with Culture teachers, based on the request of the culture programmers in your communities. In these workshops, we provide updated research on language and culture. We also provide echnological training for teachers to teach with technology. All PAGC schools are equipped with iPads and smartboards. We report the PAGC Directors and Coordinators, this year we asked that Language and Culture be addendum to your existing policy. To gain autonomy and future official status of our languages and culture it be made “Law” in all our policies. 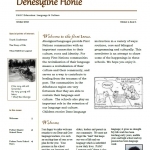 Within just four years, we have made huge language projects, we work based on PAGC Sectors on linguistic dialects. Our goals extend to the vision of our PAGC communities; yes, we are awakening our languages – our ancestors are happy.